The Golden Dames Project - Page 2: Kidnapped! In 1912 the pulp magazine All-Story serialized a novel called Under the Moons of Mars by Edgar Rice Burroughs. In the story, former Confederate captain and seeming immortal John Carter is transported via astral projection to Barsoom (aka Mars) where his intelligence, wit and skill eventually win him the position of Warlord of Mars. John Carter of Mars probably wasn't the first "stranger in a strange land". History is populated with stories of characters from the mundane world being transported to exotic and fantastic lands where they become heroes or rules. John Carter of Mars, however, set the tone for how the "stranger in a strange land" premise would be used in science fiction. Fast forward to 1928. Armageddon 2419 A.D. by Phillip Frances Nowlan is published in the famous pulp science fiction magazine Amazing Stories. Readers thrill as Anthony Rogers, a World War I veteran, falls victim to radioactive gas and falls into suspended animation. Rogers wakes 492 years later in a world where the United States has been toppled by the Hans of Mongolia. The descendants of Americans now live in gangs spread throughout the wilds of North America. They're ready to take back their land - all they need is someone to lead them. Rogers turns out to be that someone, of course. His experience as a soldier in World War I combined with the advanced technology of the 25th century are just what is needed to defeat the enemy. The story of Anthony Rogers might have been a footnote in science fiction history - a few stories published in the pulps - if not for John F. Dille, the president of the National Newspaper Service syndicate. Dille hired Mr. Nowlan to turn his pulp stories into a comic strip with one change: the name of the lead character needed to be punchier. Stronger. And thus, Buck Rogers was born. The comic strip was a huge success. 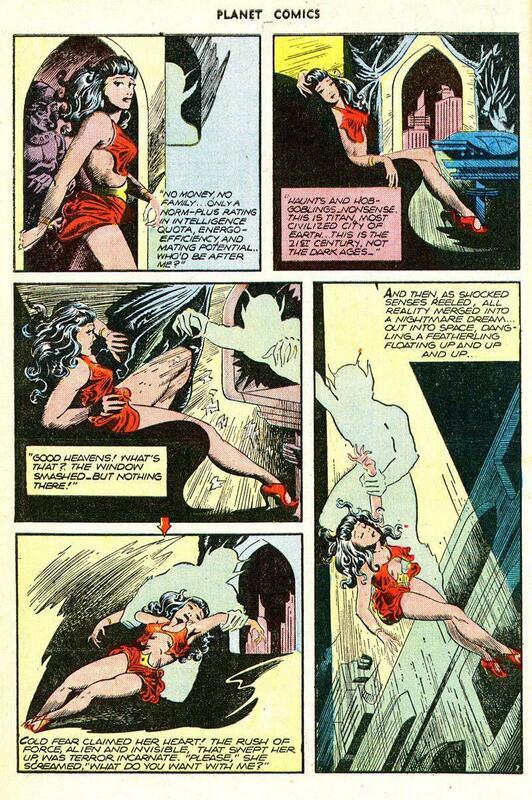 To compete with Buck Rogers, the King Features syndicate hired artist Alex Raymond to create another science fiction epic. Raymond took inspiration from both John Carter and Buck Rogers to create polo player and Yale University graduate, Flash Gordon, in 1934. Readers thrilled week after week as Flash Gordon traveled to the planet Mongo and had any number of thrilling adventures as he sought to save both Earth and Mongo from the ruthless dictator, Ming the Merciless. Along the way Flash made friends, defeated monsters and attracted the attention of countless beautiful princesses and queens (but always stayed true to his Earth love interest, Dale Arden). Where John Carter was a pulp invention and Buck Rogers was a pulp invention adapted for comics, Flash Gordon was invented specifically for the newspaper funny pages and in the long run, his popularity surpassed the others. Flash Gordon proved that a science fiction character created for comics could succeed. 1. Their readers liked John Carter/Buck Rogers/Flash Gordon style adventures. 2. Their readers like looking at pictures of scantily clad, attractive women. And thus, Futura was born. Like Carter, Rogers, and Gordon, Futura is a stranger in a strange land - transported from Earth to a new world where she becomes both hero and general, conquering evil. There are important differences, however. Futura represents a change in the "stranger" formula. First, she's nothing special. While Carter and Rogers are war veterans and Gordon is a rugged polo player, Futura is a low level secretary. As Futura herself says she has "no money, no family... only a norm-plus rating intelligence quota, energo-efficiency, and mating potential". However, once removed from the repressive atmosphere of a world where every aspect of life is analyzed and categorized Futura flourishes as an action hero and rebel leader. In fact, that's another difference. Carter, Rogers, and Gordon all come from the present day (from the point of view of their publication date) but Futura lived on Earth in the 21st century. This gives her familiarity with advanced technology such as that used by her enemies, allowing the comic to skip tedious scenes in which Futura learns how to fly a rocket ship or use a jet pack. Most importantly, Futura is a woman. It is true she's drawn to please the male eye but her gender is never truly a factor. The natives of her new world distrust her at first because she's an outsider, not a woman. More importantly, Futura makes allies as well as Carter, strategizes as well as Rogers, and does daring do as well as Gordon. There's a line from John Carter to Buck Rogers to Flash Gordon to Futura in the science fiction "stranger in a strange land" family. Sadly, though, she remains one of the few leading women in a field crowded by leading men. I love this page. In a few panels we get a real sense of what this version of 21st century Earth is like. Everyone is obviously tested and cataloged according to multiple factors, including intelligence and mating potential. This is an interesting and sly dig on the emerging concept of eugenics by the writer. And, of course, the art remains gorgeous. That line, from Rogers to Gordon to Futura, where do you think it went? I'm thinking Adam Strange, but you probably have a better idea. I would say the line continues on to Adam Strange. Also, to a less limited degree, to Star Wars. Of course, the outsider going on to become a hero idea is common in many more recent stories: Robotech, Harry Potter and my own Mysteries of the Arcana are all good examples. An interesting reverse is also possible. Look at Thor - the being from an exotic location coming to become a hero here on Earth.